Today is the big day!!! My Furry Valentine FREE adoption event. Valentine’s Day is coming and it’s time to find the perfect gift for your special someone! Look no further! Take them to our My Furry Valentine event and find them an adorable pup or cat for FREE! 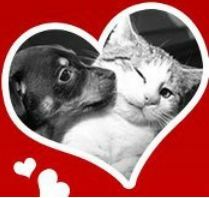 Saturday February 9th, 2013 all OK Humane cats and dogs will be fee-waived (meaning FREE) to adopt! This special is valid at the OK Humane Adoption Center from 11-7pm at 7500 N. Western Avenue in Oklahoma City. We’ll also have free to adopt cats at the Edmond PetSmart (starting at 11am) and I-240 PetSmart (starting at 9am). Click here to see our available animals. If you have a certain pup or cat in mind head on over! We hope to see you there! More My Furry Valentine info here.